There is already a plethora of bands (not saying that’s a bad thing), like FIDLAR and SO many on Burger, that musically express the endless, fucked up daze we all wish were our lives permanently. 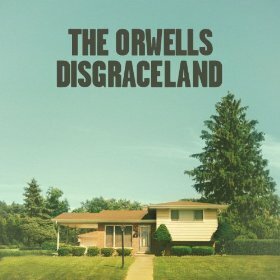 The Orwells did this so beautifully on their first EP and Remember When, but Disgraceland is giving a more polished sound that kind of contrasts the band as a whole. Sure. Lyrically, they’re still all about days filled with boozin’ and dicking around. What else should we expect? They’re teenagers, literally. The only comparison that comes to mind is the leap from Black Lips‘ self-titled debut to how they sound now with Underneath The Rainbow, except The Orwells did this within one album release. Singer Mario Cuomo has toned down his liquor tinged rasp to a slightly cleaner and tighter sound, but it makes him sound more like Julian Casablancas than our beloved little troublemaker of a frontman. Disgraceland ISN’T awful, it’s just…inexplicably different. “Hallway Homicide” forever, please and thank you.